From today, motorists caught using a handheld mobile phone while driving will automatically receive six penalty points and a £200 fine. Newer drivers, who have a limit of six points within their first two years of driving, could find their licence immediately revoked if they’re caught. They will then have to reapply for a provisional licence and retake their driving test. Some cases may also go to court, where there is a maximum fine of £1000. Bus or HGV drivers face a maximum fine of £2500. It has been illegal to use a mobile phone, or similar device, while the engine is running since December 2003. This includes when stopped at a red light or queuing in traffic. The previous penalty was three points and a £100 fine. However it was determined by the government that this system was not deterring motorists from using their phone while driving. Those caught will receive a £200 on-the-spot fine, but if they are caught twice and accrue 12 points they will also automatically appear in court and face a fine of £1000 plus a driving ban of at least six months. Why are tougher sanctions being introduced? Illegal mobile phone use by drivers is rising, according to new research from the RAC. The study found that almost one in three motorists admitted to using a handheld phone behind the wheel compared with around one in 10 in 2014. 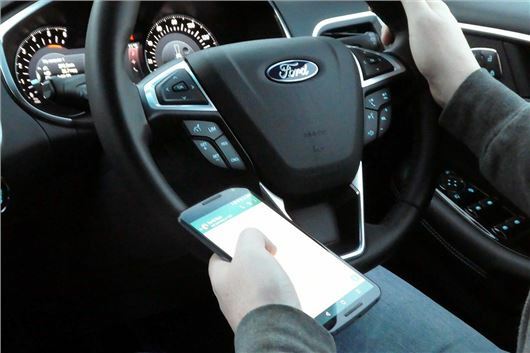 The Department for Transport said that one in five deaths caused by distractions in 2012 were because of mobile use, a higher death rate than other in-car causes. This had risen to 22 fatal accidents in 2015, but nobody was jailed as a result. In fact, the number of convictions for mobile phone use has halved, as have fines imposed by the courts, since 2010. However, this may be down to a significant decrease in the number of full-time road police officers in England and Wales between 2010 and 2015, rather than less drivers using their phones. Department for Transport figures show that driver distraction by a phone was a contributory factor in 492 accidents in Britain in 2014, including 21 that were fatal and 84 classed as serious. In November 2016, Tomasz Kroker was convicted of causing four counts of death by dangerous driving and jailed for ten years. Kroker was changing the music on his phone when the HGV he was driving ploughed into a queue of stationary traffic at 50mph, killing a mother and three children. Can I legally use my phone at the wheel? If your phone is in a cradle then you may press a single button to answer a call, but pressing multiple buttons - like a text - is illegal. It is, however, legal to make and receive calls using a hands-free system. Many new cars come with Bluetooth systems fitted as standard, which allows the driver to use their phone legally. Although, even when using a legal hands-free kit, drivers can still be charged with careless driving, dangerous driving or driving without due care and attention if the police believe that it affected their standard of driving. Anyone know what the situation is regarding cars with builtin touchscreens and the new laws that came in yesterday? I've not seen any mention of them in the legislation but surely looking down at a touchscreen panel and using it, which is normally below the dashboard, is worse than a mobile in a cradle as it's at or just below eyeline. You will not get fined/points for using an in-built touchscreen, however, if anything in a car is distracting a driver and affecting their driving then they can be prosecuted for driving without due care and attention. Using a mobile Fine should be £500 first offence and automatic 1 month ban to concentrate the mind and then £1000 minimum fine and 12 month ban and a retest. Look at european fines.. we've got it easy here. When I was in Sydney 16+ years ago, I was traveliing with a NSW police officer in his patrol car, and he thought nothing of taking a call on his hand-held mobile, whilst driving. He had one hand on the steering wheel at all times, whilst he took the call with the phone in his other hand. It was apparently all perfectly legal in NSW at the time (2000). I don't know if the law in Australia has since changed? Here in the UK, its ok to use a mobile, as long as its hands-free. But as others have pointed out, using a dashboard touchscreen navigation for sending and receiving calls, can be just as distracting as actually holding the phone, surely? And what about eating an apple (or anything else) whilst driving?